This week I would like to take a look at current trends in card prices and determine why spikes or gradual increases for particular cards are occurring. Splinter Twin exploded in value Friday. As of the time of this writing, it is currently sitting around $8 TCG Mid with many vendors selling at that price or higher. Before Friday, the card could easily be had for $4-$5. 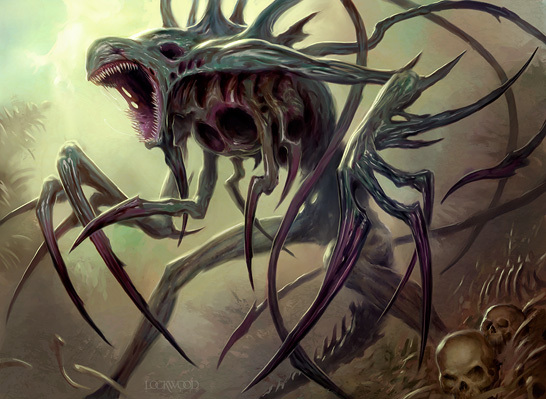 Players are starting to speculate on Splinter Twin because it is one of the core components of the aptly named Splinter Twin combo deck in Modern. At this point, is it still pure speculation or will the price hold? 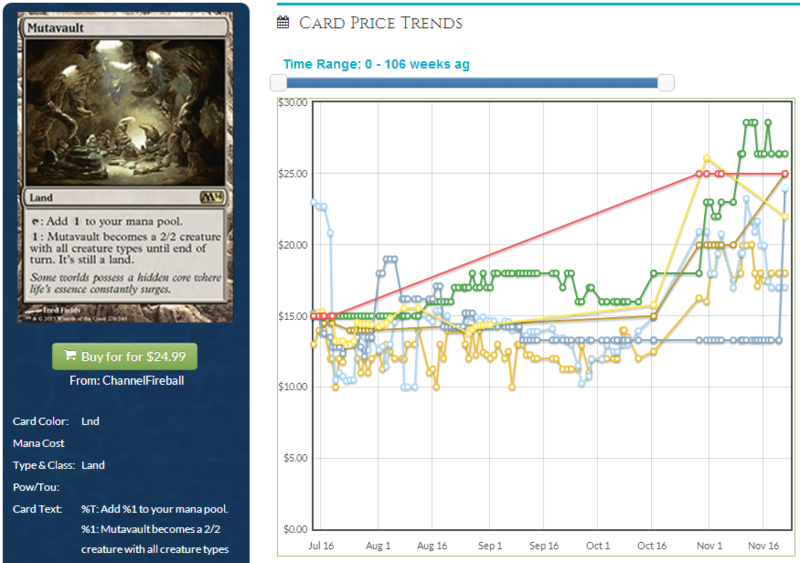 If we look at the last Modern season, there was also a price spike on Splinter Twin. Once the Exarch/Twin deck made its debut in Modern, Splinter Twin immediately skyrocketed (like many other Modern staples, such as Karn and Fetchlands) and stayed at that price throughout most of the previous season. Since then it has slowly trickled back down to around $4. Now with the recent spike it is currently trending upwards again towards the previous highs of $10+ dollars. It is entirely possible that without a banning Splinter Twin could see even higher prices than the previous Modern season because a reprint has yet to occur. I am going to keep a close eye on this card moving forward to see if continues to trend upwards. Let the rise begin! I’ve mentioned Griselbrand previously so I really hope you followed my advice and started picking them up before everyone else realized that he has true staying power, both in Modern and other eternal formats. Even with all the hype, there could be potential downsides moving forward. Wizards can be very fickle with Modern as a format, since they can and will ban cards at any point. They also can and will print cards as needed to satisfy the increased demand. Even taking these two points into account, I still think Griselbrand is safe for a while from both of these potentialities. Expect this guy to reach Emrakul levels eventually; however you could also take advantage of this year’s Modern spike to cash out early if you felt so inclined. Here we have a Modern card that has had a major price spike that currently isn’t a format staple. I believe that Phyrexian Obliterator is purely a speculative increase due to unrealized potential in Modern. This is because many people are trying to get Nykthos, Shrine to Nyx to work as well in Modern as it does in Standard. With cards like Phyrexian Obliterator, I can see why. Other cards that could pump up the power in this deck include Garza’s Assasin, Gatekeeper of Malakir, Demigod of Revenge, Geralf’s Messenger, Phyrexian Arena, and even… yes, Gray Merchant of Asphodel, that common that stomped you in limited. Hmm, there might be something to this card after all. Phyrexian Obliterator already has an awesome casual following, which has buoyed the cards price at $10-$15 until recently. However, I can’t justify jumping in at this point because the price has already started to climb as high as $17 per copy. My advice would be to be to sell or trade any copies you are sitting on because this card is too risky for me at this point. Did you know that Ajani has currently reached around $8 TCG mid and is sitting at $10 or higher retail? In the shadows, Ajani has been slowly ticking up in price since this summer when he was sitting around $4-$5 per copy. Why the sudden uptick in price for this version of Ajani? He is only played in about 5% of the current standard decks and at an average of only two copies per deck. My opinion are twofold – first, players are starting to brew with white aggro decks in Standard more and more, perhaps hoping that Born of the Gods will be able to make the archetype better. Second, Planeswalkers are popular casual cards that derive part of their price from their appeal to casual players. Considering both these factors, it appears that Ajani is slowly climbing in price as the Standard tournament season is approaching. I’m not sure if Ajani will go up higher or maintain his price because right now it appears to be going up somewhat speculatively since he currently doesn’t have much of a home in many decks. However, this is certainly a card to watch out for moving forward because people are buying them whether for Standard or otherwise. I believe that Mutavault will continue to be a slow, steady gainer and as we approach Standard season in January. It has been slowly gaining since the middle of October and has gone from around $14 per copy TCG mid to $22 per copy. It is a popular manland that will continue to be a tournament staple as long as players push devotion with Nykthos, Shrine to Nyx. Even if this strategy falls out of favor, control players will want to play Mutavault because it gives of the utility it provides in the land slot. I would be surprised if Mutavault dropped in price during the Standard PTQ season. Garruk was down to around $14 in the middle of October and has since gone up to around $22 per copy. He has followed a similar pattern to Mutavault, which is strange to me because he is a mythic rare. Either he should be sitting at around $25+ due to tournament playability or he should be around $10 like most of the other Planeswalkers in Standard. In Garruk’s case, I think the majority of his price is due to the role he plays in the mono-green or R/G devotion strategies. Domri Rade seems to be played side by side with Garruk when he is paired with R/G, and with mono green devotion there is no better Planeswalker than Garruk. This slow but steady gainer should maintain his price throughout Standard season. He could spike if mono green devotion somehow becomes a Tier 1 deck but I think his price will still rise anyways because he is the most powerful green Planeswalker in Standard. I’m not sure a lot of people realize this but Sliver Legion’s average price is around $35! Similar to Kozilek, Butcher of Truth, that is a ton of money for a purely casual card. Not that he has spiked recently – the card is a slow, steady gainer that yields results. Last year Sliver Legion was hovering around an average price of $25 and has slowly crept up from there. Moving forward, I can’t see how this card will ever go down in price barring a mass reprint in a Commander product or other type of deck that Wizard’s releases. Definitely keep an eye out for this card at the trade tables, because if you can pick them up for your undesirables, or if you can trade them into Modern of Legacy eternal playables, you won’t go wrong.